This is what happens when you crave sandwiches and the only bread you have are those days-and-days-old bready end bits hanging in the bread bag. 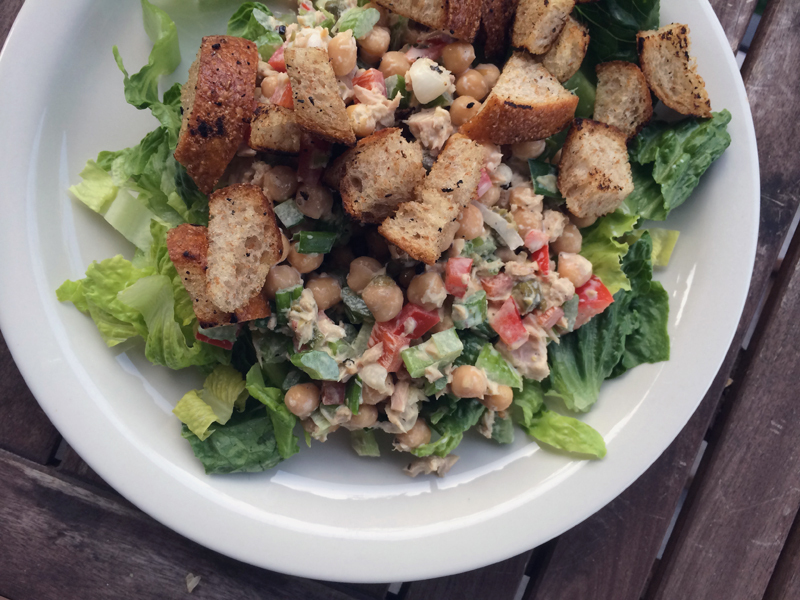 So you call yourself innovative and make a salad with big buttery, garlicky homemade croutons and your summer supper turns out deliciously. 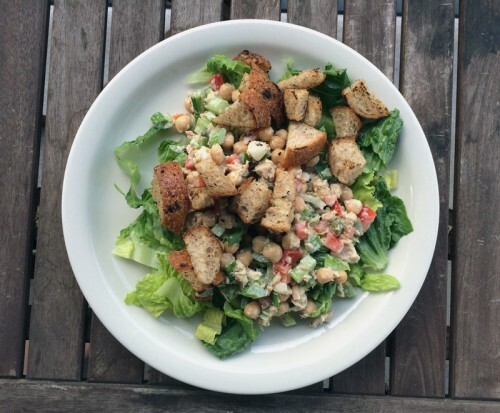 Originally, I was craving this chickpea salad/sandwich stuffer recipe. It’s delicious. But then I spied a recipe that looked very similar but included a can of tuna. I had a can of tuna! So I modified the recipe based on what I had and came up with something quite tasty. It’s lemony and tangy and crunchy and totally refreshing. Perfect summer evening food. Even more perfect after a hot and busy day where you’re quite pooped by nightfall and calling away for take-out seems easier. This meal is flexible and you probably have most everything in your fridge and cupboards. It’s a bit of a big ol’ lifesaver kind of meal. Vegetables get diced, cans get drained and dumped, plops of dijon, mayo and yogurt get mixed along with a few other flavour enhancers and there you have it. 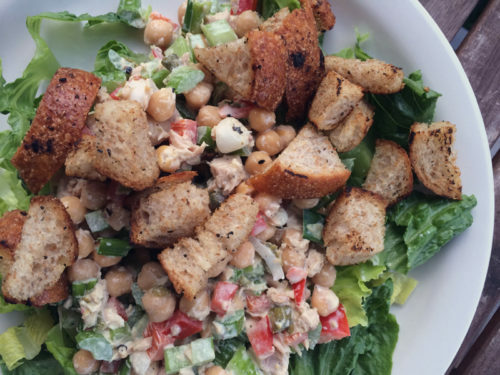 But wait, take the extra step and make a batch of homemade croutons. No oven needed, it’s too freakin’ hot for that. Just use a skillet, some butter, garlic and day old bread. The end ugly pieces that get left in the bag are perfect for this. Lightly toast them until they get fragrant, crispy and chewy. Add some greens to your plate, top with the salad mixture and scatter the warm croutons over top. Eat outside if preferable. Or in front of the tv watching Comedy Bang Bang (my new favourite tv discovery – their podcast is great too especially when you’re road-trippin’!). No judgements, just delicious. Eat up. PS, I just ate the leftovers for lunch. No croutons, sadly. But! But!! It was so, so good. Cold from the fridge on a hot day. Hello, lunch. A perfect summer meal. If you have some fresh garden tomatoes on hand, chop one up and throw it in – it would be a lovely addition to a summer supper. Or forgo the croutons and stuff this mixture into pita bread for a messy but delicious sandwich. Next time I make this, I’m adding in 2 cans of tuna because I think the tuna got a bit lost here. If you’re vegetarian, skip the tuna, and it will be just as delicious. In a large serving bowl, combine all the vegetables and chickpeas together. Add the tuna, breaking into the tuna with a fork. Stir in the brine (if using), along with the mustard, yogurt, mayo, capers and lemon juice/zest. Add in hot sauce and salt and pepper after tasting & only if needed. Set aside. In a medium sized skillet, melt butter and let the garlic get fragrant over medium-high heat. Add in the bread cubes, stirring until coated in butter. Toast the bread, turning occasionally to not burn. Remove from heat when crisp. 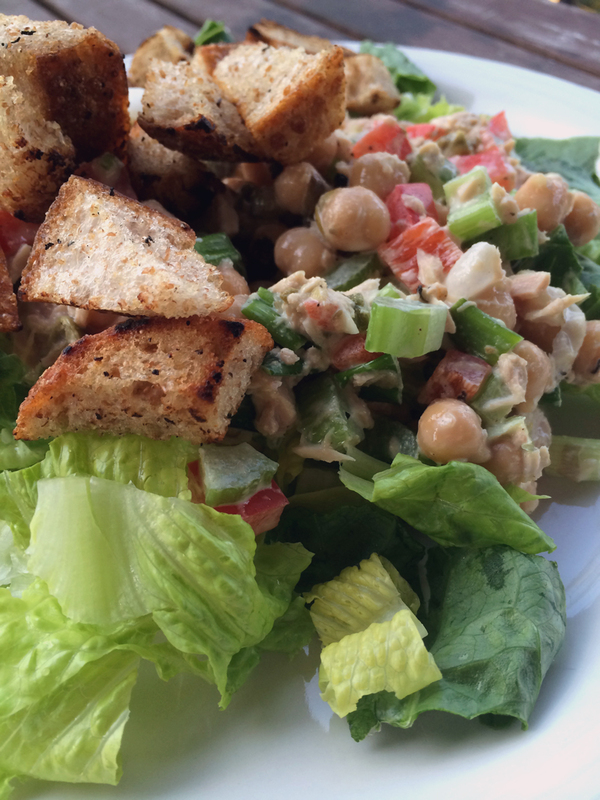 To serve, line 4 plates with the mixed greens, top with the chickpea-tuna mixture and then scatter croutons over top. Dig in. This is the kind of lunch I can barely wait until 12:00 to indulge in. Looks so delicious!! Yes! I have been really enjoying tuna salads lately, so I’m super excited to see this new twist. I love how the tuna and chickpea (i.e. typically faux-tuna) elements collide! So fun! Salad! The kind that makes lunch more exciting. I love it! Exactly, Eileen! It’s a good combo that works well. isnt this just the perfect lunch time salad! definitely will be having this tomorrow.. thanks for the recipe! This looks amazingly delicious and perfectly fitting for warm summer days! When making almost any kind of salad, I always use spinach along with other greens. Firstly, because I love it so much, and secondly, because it tastes great and it is full of vitamins. Two birds. And I am missing tomatoes in the recipe, but I guess everyone can mix and match whatever they prefer. Anyway, I am saving the recipe for the future, so thanks! Vancouver Bakeries, and it wasn’t helpful at all. Thank you! Hi Laurie, I’m not a huge fan of tomatoes – I mention that they might be good in the headnote, but I didn’t add them to my version. But please, add them to yours! As for good Vancouver bakeries, I’d check Yelp. I do love Rook because they have amazing croissants and it’s within walking distance to my house. I sometimes make a similar dish for my husband to take to work with him. Stating with canned chickpeas and canned salmon, I add whatever works and whatever I have on hand: a few chopped tomatoes, scallions, some cuke slices and olive oil/balsamic vinegar. Next time I recreate this mega protein packed nutritious salad, I’ll be adopting some of your dressing ideas: yogurt, pickle brine, mustard, mayo! Give this a go, Joanne, I’m sure you and your husband would love this. Jules, thanks! Me too 🙂 Chickpeas are great!